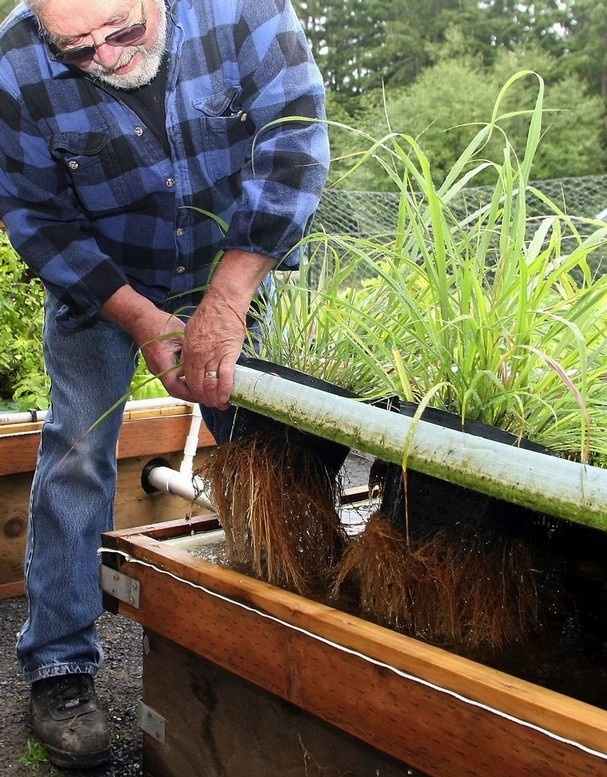 One might be tempted to say that a Port Orchard couple, Rene and Linda LaMarche, are breaking new ground by growing trout instead of tilapia in their backyard aquaponic system. But the truth is they’re not using the ground or any type of soil at all. Rene LaMarche shows off the root system of plants growing in his aquaponic garden at his Port Orchard home. Aquaponics is a combination of aquaculture (in this case growing fish) and hydroponics (growing crops in water). The system is set up so that leafy green vegetables thrive from the waste excreted by fish, which are cultured for optimal growth. So you end up with a full-meal deal. Reporter Chris Henry wrote about the LaMarche enterprise in a story in Friday’s Kitsap Sun. 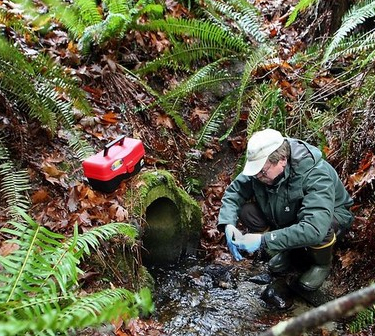 The whole thing sounds impressive, and I think the buying public will be more interested in trout than tilapia — not to mention the fact that trout are native to the Northwest and fit in better with our climate. As with any enterprise, the key will be to balance the costs, so that you can sell your produce for a profit. Chris Henry likens Rene LaMarche to the “Johnny Appleseed” of aquaponic gardening. LaMarche envisions lots and lots of people getting involved in growing their own. Washington state, Puget Sound and the Kitsap Peninsula are known for their aquaculture. Commercial oyster beds in Hood Canal, geoduck growing areas in Case Inlet and salmon farms off Bainbridge Island are among the many aquaculture facilities that we have. Officials at the National Oceanic and Atmospheric Administration recognize the tremendous economic value and potential of aquaculture projects throughout the country — including offshore facilities. The potential for feeding large numbers of people is part of the equation. On the other hand, the potential for overrunning our natural ecosystems is a serious concern. For extensive information on this effort, check out the website for NOAA’s Aquaculture Program. The world’s fish populations are already being affected by global warming, and the human population faces long-term consequences with respect to seafood supplies and local economies that depend on them, according to a statement from the United Nations Food and Agriculture Organization. These conclusions are coming out of a four-day conference of 200 experts and policymakers focused on the marine fisheries issue. The conference, in Rome, Italy, comes to a close today. Oceans are warming, while currents, such as those affected by El Nino, seem to be changing. This could have implications for the West Coast. Salinity is changing in surface waters, with warming areas of Earth growing more salty from evaporation, while more northern and southern areas grow less salty from increased rain along with ice and snow melt. Global sea level has been rising since 1961 with an accelerated rate since 1993. Fish distribution has been changing, generally with both warm- and cold-water species moving closer to the poles. Changes in fish availability will change at the local and regional levels. Markets for various seafoods could grow unstable, as distribution systems try to respond to shifts in supply at various locations. Prices for various seafoods could fluctuate with uncertain supplies, and those in the industry could see their jobs disrupted. Countries where people eat a lot of seafood may face changes in nutrition with related health implications. At both the local and global levels, fisheries and aquaculture play important roles in providing food and generating income. Some 42 million people work directly in the sector, the great majority in developing countries. Adding those who work in associated processing, marketing, distribution and supply industries, the sector supports several hundred million livelihoods. Aquatic foods have high nutritional quality, contributing 20 percent or more of average per capita animal protein intake for more than 2.8 billion people, again mostly in developing countries. Fish is also the world’s most widely traded foodstuff and a key source of export earnings for many poorer countries. The sector has particular significance for small island states.